SAN FRANCISCO — The Nichi Bei Foundation Author Series presents a book release party for Hiroshi Kashiwagi on Saturday, Nov. 2, from 3 to 5 p.m. at the Western Addition Branch Library, 1550 Scott St. (between Geary and Post) near San Francisco Japantown. Kashiwagi, author of “Swimming in the American” and “Ocean Beach,” has just released a new book, “Starting From Loomis and Other Stories,” edited and with an introduction by Tim Yamamura. The book will be available for purchase at the event ($5 discount for Nichi Bei Foundation members). The Nichi Bei Foundation presents as part of its inaugural Author Series a book talk and signing by Kashiwagi, an accomplished author, playwright, poet and actor. He also once served as branch manager at the Western Addition Branch Library, and started the library’s Japanese Language Collection. 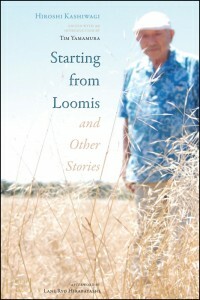 In “Starting from Loomis and Other Stories,” he reflects upon the moments, people, forces, mysteries, and choices that have made him who he is. Central to this collection are his experiences as a Japanese American during World War II — from his imprisonment at Tule Lake to the resulting lifelong stigma of being labeled a “no-no boy” after his years of incarceration. The event will also feature Kevin Wildie, author of “Sacramento’s Historic Japantown: Legacy of a Lost Neighborhood.” By 1910, Japanese pioneers had created a vibrant community in the heart of Sacramento — one of the largest in California. Then, in the 1950s when the Capitol Mall Redevelopment Project reshaped the city center, that Japantown was truly lost. Drawing on oral histories and previously unpublished photographs, Wildie traces stories of immigration, incarceration and community solidarity, crafting an unparalleled account of Japantown’s legacy. Event funded by The Henri and Tomoye Takahashi Charitable Foundation.